* See "Confusion at noon and midnight"
The 24-hour clock is the convention of time keeping in which the day runs from midnight to midnight and is divided into 24 hours, indicated by the hours passed since midnight, from 0 to 23. This system is the most commonly used time notation in the world today, and is used by international standard ISO 8601. A limited number of countries, particularly English-speaking, use the 12-hour clock, or a mixture of the 24- and 12-hour time systems. In countries where the 12-hour clock is still dominant, some professions prefer to use the 24-hour clock. For example, in the practice of medicine the 24-hour clock is generally used in documentation of care as it prevents any ambiguity as to when events occurred in a patient's medical history. In the United States and a handful of other countries, it is popularly referred to as military time. 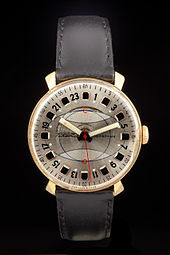 A Russian 24 hour watch for polar expeditions from 1969, made by Soviet watchmaker Raketa. Polar nights or days make it necessary to use a 24-hour scale instead of 12. A time of day is written in the 24-hour notation in the form hh:mm (for example 01:23) or hh:mm:ss (for example, 01:23:45), where hh (00 to 23) is the number of full hours that have passed since midnight, mm (00 to 59) is the number of full minutes that have passed since the last full hour, and ss (00 to 59) is the number of seconds since the last full minute. In the case of a leap second, the value of ss may extend to 60. A leading zero is added for numbers under 10, but it is optional for the hours. The leading zero is very commonly used in computer applications, and always used when a specification requires it (for example, ISO 8601). Where subsecond resolution is required, the seconds can be a decimal fraction; that is, the fractional part follows a decimal dot or comma, as in 01:23:45.678. The most commonly used separator symbol between hours, minutes and seconds is the colon, which is also the symbol used in ISO 8601. In the past, some European countries used the dot on the line as a separator, but most national standards on time notation have since then been changed to the international standard colon. In some contexts (including the U.S. military and some computer protocols), no separator is used and times are written as, for example, "2359". In the 24-hour time notation, the day begins at midnight, 00:00, and the last minute of the day begins at 23:59. Where convenient, the notation 24:00 may also be used to refer to midnight at the end of a given date – that is, 24:00 of one day is the same time as 00:00 of the following day. The notation 24:00 mainly serves to refer to the exact end of a day in a time interval. A typical usage is giving opening hours ending at midnight (e.g. "00:00–24:00", "07:00–24:00"). Similarly, some bus and train timetables show 00:00 as departure time and 24:00 as arrival time. Legal contracts often run from the start date at 00:00 until the end date at 24:00. While the 24-hour notation unambiguously distinguishes between midnight at the start (00:00) and end (24:00) of any given date, there is no commonly accepted distinction among users of the 12-hour notation. Style guides and military communication regulations in some English-speaking countries discourage the use of 24:00 even in the 24-hour notation, and recommend reporting times near midnight as 23:59 or 00:01 instead. Sometimes the use of 00:00 is also avoided. In variance with this, the correspondence manual for the U.S. Navy and U.S. Marine Corps formerly specified 0001 to 2400. The manual was updated in June 2015 to use 0000 to 2359. Danish multi-ride ticket with non-standard timestamp "27:45". Time-of-day notations beyond 24:00 (such as 24:01 or 25:00 instead of 00:01 or 01:00) are not commonly used and not covered by the relevant standards. However, they have been used occasionally in some special contexts in the UK, Canada, Japan, South Korea, Hong Kong and China where business hours extend beyond midnight, such as broadcast television production and scheduling. In most countries, computers by default show the time in 24-hour notation. For example, Microsoft Windows and macOS activate the 12-hour notation by default only if a computer is in a handful of specific language and region settings. The 24-hour system is commonly used in text-based interfaces. Programs such as ls default to displaying timestamps in 24 hour format. In American and Canadian English, the term military time is a synonym for the 24-hour clock. In these dialects, the time of day is customarily given almost exclusively using the 12-hour clock notation, which counts the hours of the day as 12, 1, ..., 11 with suffixes a.m. and p.m. distinguishing the two diurnal repetitions of this sequence. The 24-hour clock is commonly used there only in some specialist areas (military, aviation, navigation, tourism, meteorology, astronomy, computing, logistics, emergency services, hospitals), where the ambiguities of the 12-hour notation are deemed too inconvenient, cumbersome, or dangerous. No hours/minutes separator is used when writing the time, and a letter designating the time zone is appended (for example "0340Z"). Leading zeros are always written out and are required to be spoken, so 5:43 a.m. is spoken "zero five forty-three" (casually) or "zero five four three" (military radio), as opposed to "five forty-three" or "five four three". Military time zones are lettered and given word designations from the NATO phonetic alphabet. For example, in US Eastern Standard Time (UTC−5), which is designated time zone R, 6:00 a.m. is written "0600R" and spoken "zero six hundred Romeo". Local time is designated as zone J or "Juliett". "1200J" ("twelve hundred Juliett") is noon local time. Greenwich Mean Time (or Coordinated Universal Time) is designated time zone Z, and thus called "Zulu time". Hours are always "hundred", never "thousand"; 1000 is "ten hundred" not "one thousand"; 2000 is "twenty hundred" not "two thousand". The 24-hour time system has its origins in the Egyptian astronomical system of decans, and has been used for centuries by scientists, astronomers, navigators, and horologists. In East Asia, time notation was 24-hour before westernization in modern times. Western-made clocks were changed into 12 dual-hours style when they were shipped to China in the Qing dynasty. 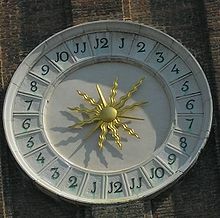 There are many surviving examples of clocks built using the 24-hour system, including the famous Orloj in Prague, and the Shepherd Gate Clock at Greenwich. 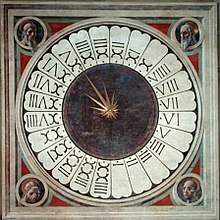 The first mechanical public clocks introduced in Italy were mechanical 24-hour clocks which counted the 24 hours of the day from one half hour after sundown to the evening of the following day. The 24th hour was the last hour of day time. However, striking clocks had to produce 300 strokes each day which required a lot of rope, and wore out the mechanism quickly, so some localities switched to ringing sequences of 1 to 12 twice (156 strokes), or even 1 to 6 repeated 4 times (84 strokes). After missing a train while travelling in Ireland in 1876 because a printed schedule listed p.m. instead of a.m., Sir Sandford Fleming proposed a single 24-hour clock for the entire world, located at the centre of the Earth, not linked to any surface meridian – a predecessor to Coordinated Universal Time. He was an early proponent of using the 24-hour clock as part of a programme to reform timekeeping, which also included establishing time zones and a standard prime meridian. The Canadian Pacific Railway was among the first organizations to adopt the 24-hour clock, at midsummer 1886. That this universal day is to be a mean solar day; is to begin for all the world at the moment of midnight of the initial meridian coinciding with the beginning of the civil day and date of that meridian, and is to be counted from zero up to twenty-four hours. This resolution was adopted by the conference. A report by a government committee in the United Kingdom noted Italy as the first country among those mentioned to adopt 24-hour time nationally, in 1893. Other European countries followed: France adopted it in 1912 (the French army in 1909), followed by Denmark (1916), and Greece (1917). By 1920, Spain, Portugal, Belgium, and Switzerland had switched, followed by Turkey (1925), and Germany (1927). By the early 1920s, many countries in Latin America had also adopted the 24-hour clock. Some of the railways in India had switched before the outbreak of the war. During World War I, the British Royal Navy adopted the 24-hour clock in 1915, and the Allied armed forces followed soon after, with the British Army switching officially in 1918. The Canadian armed forces first started to use the 24-hour clock in late 1917. In 1920, the US Navy was the first US organization to adopt the system; the US Army, however, did not officially adopt the 24-hour clock until World War II, on July 1, 1942. The use of the 24-hour clock in the United Kingdom has grown steadily since the beginning of the 20th century, although attempts to make the system official failed more than once. In 1934, the BBC switched to the 24-hour clock for broadcast announcements and programme listings. The experiment was halted after five months following a lack of enthusiasm from the public, and the BBC continued using the 12-hour clock. In the same year, the US airlines Pan American World Airways Corporation and Western Airlines both adopted the 24-hour clock. In modern times, the BBC uses a mixture of both the 12-hour and the 24-hour clock. British Rail and London Transport switched to the 24-hour clock for timetables in 1964. A mixture of the 12- and 24-hour clocks similarly prevails in other English-speaking Commonwealth countries: French speakers have adopted the 24-hour clock in Canada much more broadly than English speakers, and Australia also uses both systems. ^ a b See the Common Locale Data Repository for detailed data about the preferred date and time notations used across the world, as well the locale settings of major computer operating systems, and the article Date and time notation by country. ^ International Standard ISO 8601: Data elements and interchange formats – Information interchange – Representation of dates and times. International Organization for Standardization, 3rd ed., 2004. ^ Pickar, Gloria D.; Graham, Hope; Swart, Beth; Swedish, Margaret (2011). Dosage calculations (2nd Canadian ed.). Toronto: Nelson Education. p. 60. ISBN 9780176502591. ^ U.S. Government Printing Office, Style Manual. "12. Numerals". Archived from the original on 2008-04-21. Retrieved 2007-09-02. ^ SECNAV M-5216.5 Department of the Navy Correspondence Manual dated March 2010, Chapter 2, Section 5 Paragraph 15. Expressing Military Time. ^ "Manual" (PDF). /www.marines.mil. June 2015. ^ "military time". Oxford Dictionaries. Oxford University Press. ^ "COMMUNICATION INSTRUCTIONS GENERAL ACP 121(I)" (PDF). Archived from the original (PDF) on 2016-05-08. ^ a b Dohrn-Van Rossum, Gerhard (1996). History of the Hour. Clock and Modern Temporal Orders. The University of Chicago Press. p. 114. ISBN 0226155110. ^ a b Fleming, Sandford (1886). "Time-reckoning for the twentieth century". Annual report of the Board of Regents of the Smithsonian Institution (1): 345–366. Reprinted in 1889: Time-reckoning for the twentieth century at the Internet Archive. ^ Blaise, Clark (2001). Time lord: Sir Sandford Fleming and the creation of standard time. New York: Pantheon Books. pp. 81–82. ISBN 978-0-375-40176-3. ^ The London Times reports on a timetable using the 24-hour clock on a trip from Port Arthur, Ontario: "A Canadian Tour". The Times (31880). London. 2 October 1886. col 1–2, p. 8. ^ a b "International Conference Held at Washington for the Purpose of Fixing a Prime Meridian and a Universal Day. October, 1884. Protocols of the proceedings". Project Gutenberg. 1884. Retrieved 30 November 2012. ^ a b c "Memorandum CAB 24/110/21 (CP 1721), 'Report of the Committee upon the 24 hour method of expressing time'". The National Archives, Kew, UK. 4 August 1920. ^ The Times: 1918 September 19, p. 3. ^ The Pittsburgh Press, 1942 July 19. 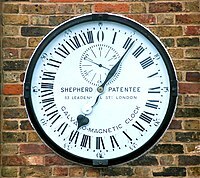 Wikimedia Commons has media related to 24-hour clocks.